Thanks to a timely tweet by North Shore Distillery, I think I’ve found the summer cocktail of 2013. The Goliath is served at The Tiny Lounge in Chicago (note to Naoto: I want to go here) and Refinery 29 shared the recipe last week. It was the perfect storm of ingredients for me, because I happened to have everything on hand Thursday night for a little impromptu happy hour on the balcony. It’s summer in a glass–lime, cucumber, herb-y Chartreuse and gin… so refreshing on a sunny afternoon! Naoto loves this cocktail, which is a little surprising since he hates Chartreuse (crazy! 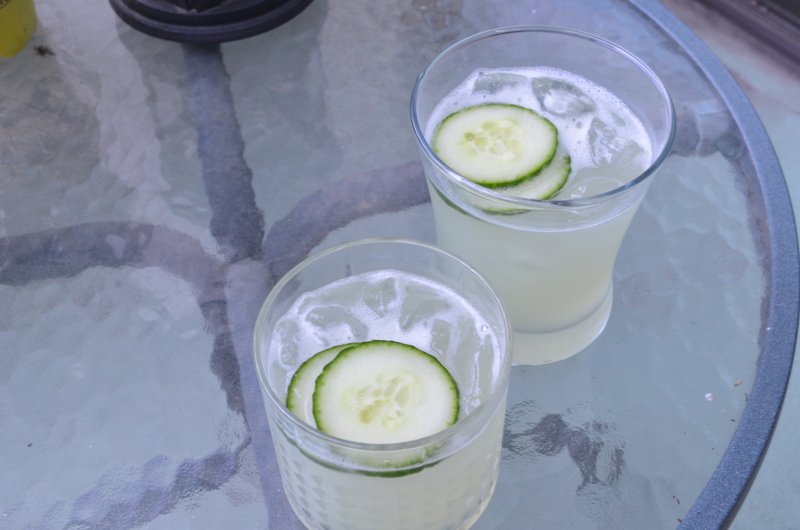 ), and we are both excited to drink a few more of these this summer with our very own, community garden grown Japanese cucumbers! Add all ingredients (except the soda) to a cocktail shaker filled with ice and shake vigorously to break up the cucumber. Strain into a glass with ice. Top with soda (we had it both ways, I prefer it without the soda) and garnish with cucumber. Enjoy on your balcony after you’ve tended to the garden. Just made this. I have yellow Chartreuse and not green, but it is still very refreshing! It IS refreshing…now I’m curious to try it with yellow chartreuse.